Councillors Sheena Lonchay and Alison Grant spoke well about the application and voiced concerns about inadequate comments by Scottish Water and possible drainage issues relating to surface water and foul sewage and made particular references to the flooding in Victoria Terrace. Councillor Lonchay forcefully made the point that flooding in Victoria Terrace was not an unusual event but occurred regularly during heavy rainfall. Emphasis was also placed upon the importance of road widening and footpath provision along Bogbeth Road and Clr. Lonnchay suggested that speed bumps should be incorporated into Bogbeth Road (this was not supported by Roads Dept. representative). Clr. Martin Ford raised an interesting point that no one had referred to (although it was indeed referred to in KCC letter of objection), which was that the site was zoned for 65 houses and the applicant proposed 66 houses. He thought this would set a precedent for developers to continue to exceed the number of houses that the LDP indicates being suitable for specific sites. It was a point well made, albeit just one house but he could not find a seconder for his motion that the number of units should be negotiated down to 65. Clr. 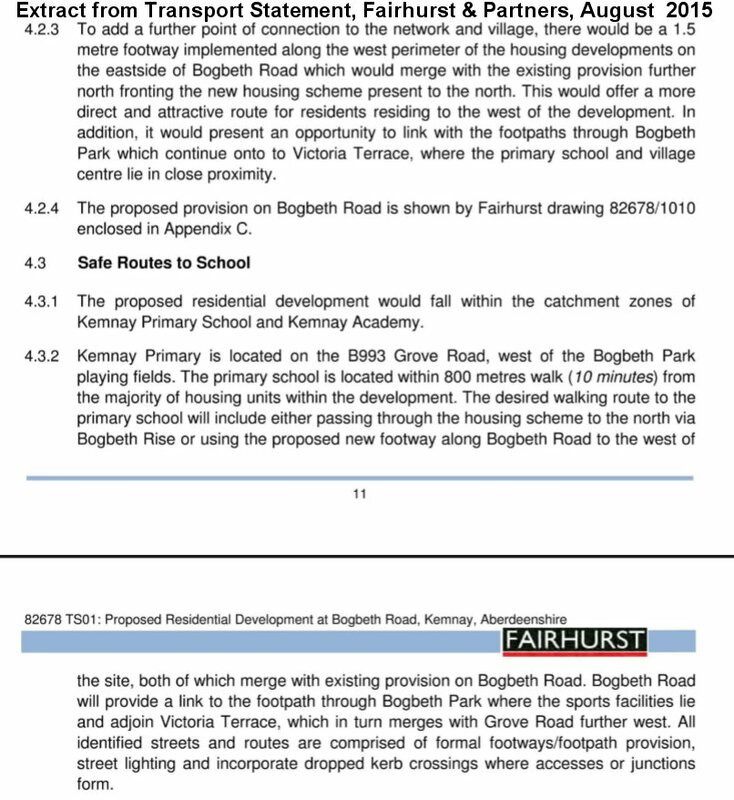 Lonchay made reference to the lack of consultation on this application making particular reference to the fact that Kemnay has a monthly Newsletter and the developer had not used this to publicise the public consultation event. It was a point well made because Clr. McKail remarked that lack of consultation was a common complaint in other communities also. Councillor Lonchay tabled an amendment to Clr. Stuart’s motion to approve, which required the inclusion of a planning condition to the effect that Scottish Water would need to confirm that sufficient drainage capacity was available prior to commencement of any development. The amendment attracted just two votes (Lonchay & Grant), and the other 8 votes were for the motion by Clr. Stuart to approve. Clr. Lonchay requested that planning gain should be directed towards medical rather than educational facilities, given that Kemnay Academy had now been extended. Kemnay Community Council received a considerable amount of praise from not only our own Councillors regarding the way we considered and made representations on planning applications (Clr. Lonchay referred to it as an “exemplar”), but numerous other Councillors including Clr. Stuart and Clr. Ford who described Community Council letters or representation as a well argued case and a model for how representations should be made. Do you wish to speak at Garioch Area Committee meeting? 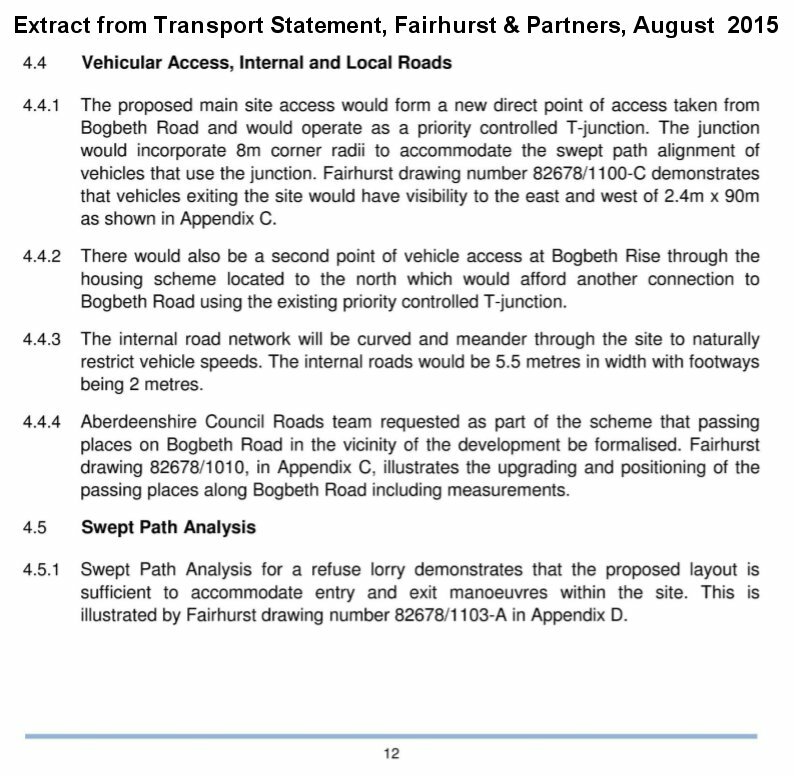 New plans submitted on 12/01/2016 showing new proposals for widening Bogbeth Road to 5.5 mtrs. with a 2 mtr. footpath running along the eastern edge of Bogbeth Road to link with the existing footpath and a pedestrian crossing at the bend to link with the existing footpath that travels along the western edge of Bogbeth Park. For clarity, the existing widened section of Bogbeth Road that serves the existing housing estate, is 5.5 mtrs. wide and the footpath is 2 mtrs. wide. Video comparing the two access roads into the proposed development, Bogbeth Brae / Bogbeth Rise and Bogbeth Road. The Developer proposes that Bogbeth Brae / Bogbeth Rise will be the Main access road and the access via Bogbeth Road will be a secondary “restricted” access. Masterplan page 4 shows this photograph of the Pre Application Community event in Kemnay Village Hall on 18th February 2014. It would seemingly be an accurate portrayal the level of public engagement i.e. 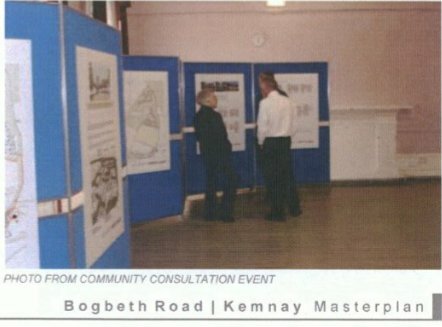 one member of the public confronted by two Halliday Fraser Munro / Barratt representatives … HOWEVER … this is NOT Kemnay Village Hall and the plans displayed are not the proposed Bogbeth Housing Development. Further evidence of a Masterplan that is not fit for purpose. 3.1 As per Section 1 above we object to this planning application unless modifications are made to the design of the SUDS features to ensure all surface water run-off on site is treated by an appropriate level of SUDS treatment types.